I have given priority to breeding Thayeri Kings also know as Variable Kings. As their name indicates,there is a great deal of variation in their color and patterns. 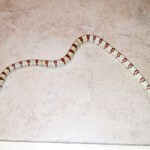 I personally favor the Milk Snake Phase (MSP) pattern. I have several outstanding MSP females that are producing some very nice babies. 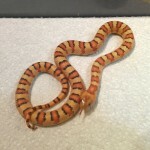 I have several Leonis Thayeri ranging from a deep orange ground color to peach and yellow ground color with very clear contrast in their patterns. Aside from their looks,another thing adding to the popularity of Thayeris is their size. 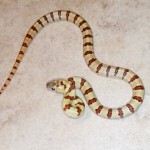 At adult size, they are generally under 36 inches which is 12 -24 inches smaller than Corn Snakes, thus needing a smaller tank/cage area. They also tend to be easy keepers and with daily handling they become quite happy to be with their owners. A word of caution I would add concerning Thayeris is that like several smaller breeds of King Snakes, getting hatchlings to start eating can often be troublesome. That is why I suggest that anyone who is a beginner with baby King Snakes should purchase babies that have been eating for at least 3-4 consecutive meals. That should insure a positive experience for the new owner AND for the baby! There are few things worse than the stress and disappointment of losing that beautiful new baby because it refuses to eat.